Alan Parsons - the symphonic prog wizard talks about The Secret, his first new studio album form15 years. Devin Townsend - reveals all about his impressive career in The Prog Interview. John Lodge - the Moody Blues bassist discusses his forthcoming UK tour dates. Syd Arthur & The Jack Hues Quartet - Canterbury scenesters creating new Canterbury sounds. O.R.k. - the prog supergroup discuss signing with Kscope and their new album Ramagehead. Cosmograf - Robin Armstrong explores everything from Jaws to mental health on his latest album. Evership - US prog duo talk about new album Evership II. The Dave Foster Band - The Steve Rothery guitarist heads out with new band album Nocebo. Ed Wynne - the Ozric Tentacles frontman hits the solo trail. RPWL - from Pink Floyd covers to fully fledged original progressive rock with the German quartet. Last Flight To Pluto - young Welsh quintet go for broke with second album. Theo Travis - the Soft Machine saxophonist reveals a glimpse of his prog life. 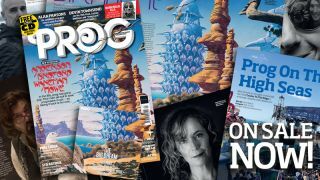 Mark Hollis - the prog world pays tribute to the late Talk Talk singer who sadly died last month. Cruise To The Edge - Prog takes to the high seas with a report from this year's Cruise. Plus live and album reviews from Alan Parsons, Banco del Mutuo Soccorso, Peter Hammill, Giancarlo Erra, Lonely Robot, VdGG, Steve Rothery Band, Fates Warning, PFM, Tangerine Dream. And music from Voyager, In Continuum, Rhys Marsh, Fervent Mind and more on the free CD.